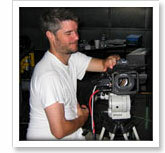 Ryan Purcell is a veteran of the Seattle film industry. He's worked with and learned from some of the most respected cinematographers in the world, including Haskel Wexler and Vilmos Sigmund among others. He's shot shorts, corporate pieces and documentaries. His film Kennewick Man: An Epic Drama of the West, which he co-directed and co-shot, has played numerous film festivals, including the Seattle International Film Festival, The American Indian Film Festival and many others. It is currently being distributed nationally. He believes the right image can illuminate the message of a film and finds the process of exposing those images rewarding.